Here I am in the city that makes and unmakes musicians. We arrived at 5 am after a rather bumpy ride and had to wait in the hotel for ever until the rooms became available, but managed to entertain ourselves with a four hour breakfast in the hotel coffee shop. We're staying at a modest but very conveniently located place, the Europa on the Kärntnerstraße, very close to a huge sheet music shop, the opera house, the EMI shop, and a lot of schnitzel. And absolutely no Thai politics ... indeed, no one here has really heard of Thailand, and the people dressed as Mozart wandering around the square keep asking us if we're Koreans. 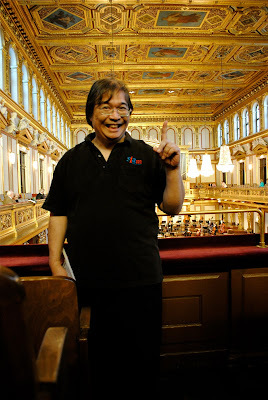 I had planned to spend the first day in bed, but the idea of seeing the VSO play Mahler 5 at the Musikverein was irresistable, so I went to the show along with the irrepressible Top and the irascible Panprapha, who is the owner of a travel TV station and the upscale magazine "Anywhere". They're planning some kind of feature piece about me wandering through Central Europe and standing around looking at various iconic vistas of classical music. I hope it will be more entertaining than the infamous facebook page "Kim Jong Il looks at things", but I doubt I will ever achieve so iconic a status. So, we went to the Musikverein ... I was able to get fairly decent seats though distant, but with those wonderful acoustics it doesn't matter much where you sit. The VSO and Hungarian trumpeter Gabor Boldoczki played through the Hummel with a lot of elan though one had the feeling that the Mahler was weighing on them, making them unable to relax. A Telemann opus provided as an encore was played with such astonishing rapidity that it was over before it started. The Mahler started off with great brilliance under Fabio Luisi, their regular conductor, and the second movement was pretty much the best live performance of that movement I've ever encountered. But the third movement was curiously directionless and the Adagietto was very strange, as though the orchestra and the conductor had never really come to terms on a mutually acceptable tempo. The last movement was very exciting and brought the audience to its feet. I was a bit surprised that the tempo for the fugato-like passages near the end was so brisk that even the Wiener Symphoniker lower strings couldn't quite get away with it, but what the hell, it was thrilling. It felt good to be at a concert where one could indeed be this picky and still have a wonderful time. Though I have to say that things aren't what they used to be here in Vienna. For instance, there was a Chinese family in box seats, standing to camcorder the whole event. When other concertgoers berated them, they started chattering very loudly (in a soft part of the first movement) and when berated again, they promptly fell asleep for the duration of the concert. I have to admit that I was a bit bewildered to see this and other examples of bad behaviour. Times really are changing. The next day I wanted Khun Jae, my journalist friend, to see something "touristy" so we took in a chamber concert in a subterranean vault belonging to some religious order where Mozart had once had a room, while composing Figaro, in fact. Lovely atnosphere, a little frescoed room with an audience of about 20 people who had all paid 39 Euros to hear Mozart played in the very room where he had once walked around. A string quartet in eighteenth-century costume played, but the costumes were as close as they managed to get to the historical Mozart. A frumpy matron led a quartet through an assortment of divertimenti and other baubles. Stylistically the performance was almost as atrocious as a quartet you might hear in an upscale Bangkok hotel. Halfway through this concert, I was starting to get very irritated by the fact that the lady was flat throughout the entire thing, and I glanced down at the programme to see that she wasn't actually the leader of the quartet but the second violinist; she had changed places with the leader, who was her own son. The violist was the dad, and the cellist someone else - an uncle? All of them had Hungarian names. The real leader, relegated to second fiddle, was playing with great determination, but couldn't save his family. During the day I sampled the joys of rummaging through stacks of second-hand music at the well known music store Doblingers, where I soon racked up a 700 Euro bill (mostly not in the second-hand section, mind you.) It was great to pick up a critical edition of the 3-movement version of Mahler's Das klagende Lied and used vocal scores of Pfitzner and von Einem operas for our Bangkok collection.